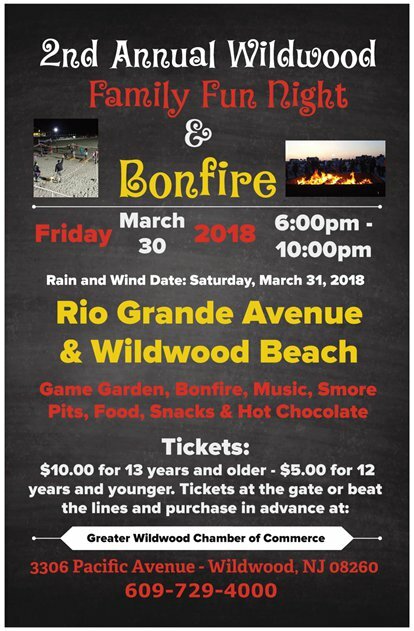 WILDWOOD, NJ – The Greater Wildwood Chamber of Commerce is sponsoring the 2th Annual Family Fun Night & Bonfire Fundraiser on the Beach, March 30 from 6-10 p.m. at Rio Grande Avenue, Wildwood, NJ. Patrons are encouraged to “bring their beach chairs,” for the first “beach day” of 2018. A family game garden and music by DJ Tony and DJ Troyboy will add to the fun. 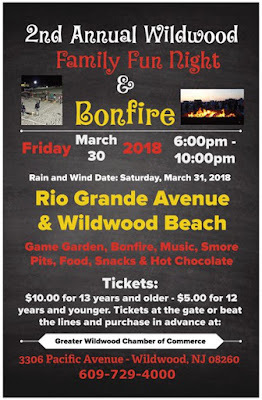 Those in attendance can purchase hot dogs, beverages and smore kits. Admission tickets are $10 per person 12 years & older, $5 per person 3 to 11 years old; 2 and under are FREE. Purchase your tickets the night of at the gate. Cash only. Gates open at 6 pm. Tickets may also be purchased in advance by contacting the Chamber at 609-729-4000 or visit the website at www.gwcoc.com. Rain date will be Saturday, March 31, 2018. Entertainment subject to change. Call 609-729-4000 for more information.